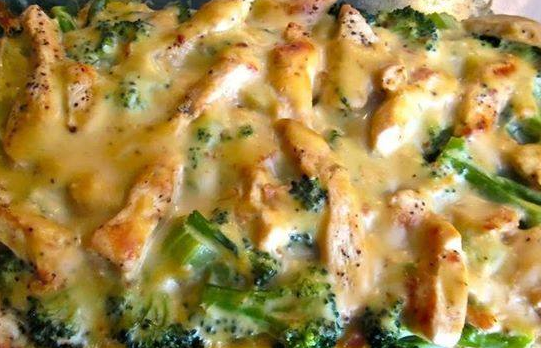 This healthy casserole is filled with chicken, broccoli and mushrooms in a creamy & light sauce. Your family will love it! Heat oven to 350 degrees. Grease a 9×13-inch baking pan with cooking spray. In a large bowl, toss together the cooked chicken and broccoli. In a smaller bowl, mix together the soup, milk and lemon juice. Add this to the chicken and broccoli and stir to combine. Spread the mixture evenly into the greased baking dish. Sprinkle with the shredded cheddar. Toss the bread crumbs and parmesan together and sprinkle evenly over the top of the casserole. Spray lightly with cooking spray. Bake, uncovered, at 350 degrees for 25 to 30 minutes, or until bubbly. Nutritional Estimates Per Serving (1/6th of recipe): 362 calories, 14 g fat, 24 g carbs, 4 g fiber, 37 g protein, 9PointsPlus, 7 SP.